Priced as low as 25¢ each! There are many choices when it comes to id badge holders. From the most basic beaded and plastic id badge holders to blank and custom printed neck id holders. Here are ONLY a few of our best selling lanyards! Need something special or custom? Contact Us! One of our best selling blank lanyards. 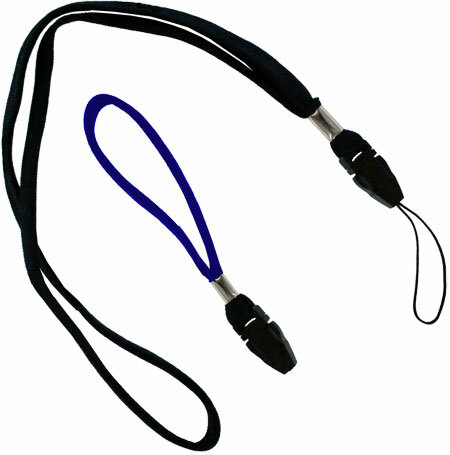 Universal safety lanyards are made from tubular 3/8" polyester and feature a durable plastic breakaway connector and snaphook. Universal safety lanyards contain no metallic parts and are therefore well suited for electrostatic sensitive environments. Available in four popular colors. Universal safety lanyards represent the best value for a basic lanyard with safety breakaway feature. Best seller. Classic round nylon lace style lanyard. Standard breakaway connector for safety release Price includes your choice of hardward, split ring, snaphook or bulldog clip. You may assort colors. Suitable style for using with coaches and referees whistles. Optional bead adjuster add $.10. Minimum Order is only 50pcs. 5/8" x36" Awareness Ribbon Lanyards are silky smooth.The perfect way to safely display name tags, to hold house keys or to display credentials for your event. Use this lanyard everyday to show your support. 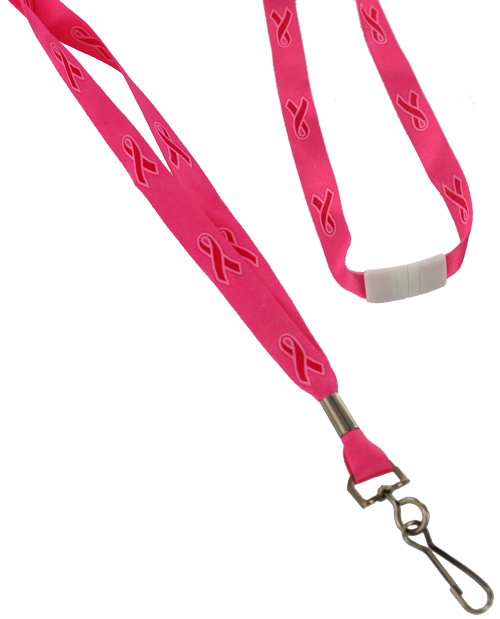 Choose from Pink or Purple color stock awareness lanyard. Or we can create and print your own custom design awareness lanyard. Features white safety breakaway. Awareness badge reels click here for link. 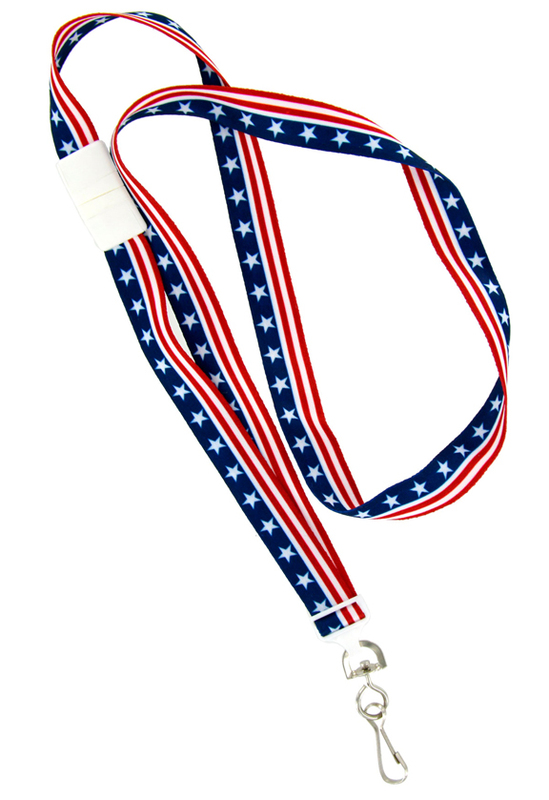 5/8" x 36" Patriotic lanyards feature an attractive red and white stripes with blue stars. Use this lanyard everyday to show your support. Features included white safety breakaway. White adjuster. Smooth satin like material. Metal snap hook. Patriotic badge reels click here for link. Standard lanyard, 3/4" wide x 36" long. They have the added feature of removable segment at the bottom of the lanyard. A convenient side squeeze buckle is used to attach and detach the lower lanyard segment containing the lanyard hardware and any object that is attached. Quick-release lanyards are ideal for card swiping systems and for other objects such as keys being used throughout the day. Custom imprint is available. Please call 518-761-0313 for more information on custom printing. Standard round lace type lanyard, 3/16" wide x 36" long. Price includes your breakaway connector and size adjuster. You may assort colors. Custom imprint is available on the badge reel. Please refer to this page link for more information and pricing. Badge reels are available in black, navy, red or white - optional hardware split ring. This is the most basic and probably oldest id badge holder. Beaded id badge holders are chains consisting of small balls known as “ball chains”. The most common is a metal with either a 3mm or 2.3 mm diameter bead with a nickel finish. Other, less common beaded id badge holders are made of plastic and are available in a wide array of colors. Beaded id badge holders are typically used with id card holders with two holes at the top. 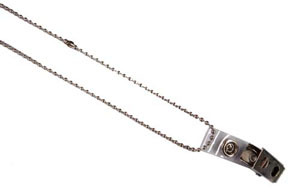 The chain is simply threaded through the holes and worn around the neck. Standard flat lace type lanyard, 3/8" wide x 36" long. Price includes squeeze hardware for the convenient quick release and reattachement of digital cameras, cell phones, or USB device. You may assort colors.